An Israeli air strike in Gaza targets two Global Jihad terrorists, says the IDF. 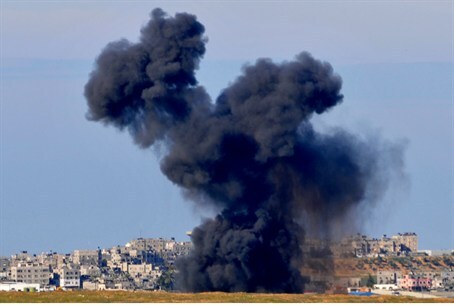 An Israeli air strike in Gaza on Sunday evening targeted two terrorists, the IDF Spokesperson said in a statement. The statement named the two as Talat Khalil Muhammad Jerbi, a Global Jihad member from Rafiah and Mohammed Abdullah Hassan Makawi, a member of the Shura Council, a terror organization based in Gaza. The operation was carried out jointly with the Israel Security Agency (Shin Bet), said the statement. It was unclear if the terrorists had been killed or wounded in the air strike. Medical sources in Gaza told AFP that one person was killed and five others were wounded in the air strike, which targeted a motorbike. "One citizen was killed and five others, including two children, were wounded by an Israeli aircraft that fired on a motorbike in the Brazil neighborhood in Rafiah," a medical source told AFP. Last month, the IDF and the Shin Bet foiled a planned terror attack in Israel by striking and killing two terrorists in southern Gaza. The two terrorists had been planning to carry out a terror attack within Israel which was almost completed. Palestinian Authority Chairman Mahmoud Abbas later called Hamas leader Ahmed Yousef and offered his condolences over the death of his brother, who was one of the terrorists killed in that air strike.